Comprehensive review of Mystic Tan Sun-Kyssed Bronzer Spray. See what real experts and actual users have to say about this self tanning product. 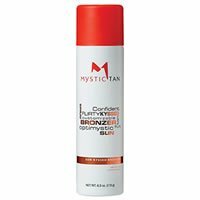 I gave Mystic Tan Sun-Kyssed Bronzer Spray 2 out of 5 stars. I had high hopes for this spray, because I’ve had good luck with Mystic Tan spray tans in the past. However, this spray fell short in my eyes. First off, my tan was so light, and it also had a reddish hue to it. I was surprised by how light my tan was and wish it were at least 3 shades darker. The red hue was also a bit odd, but the bottle does say it has red undertones. The smell is just ok, nothing great and nothing too bad either. But the application process is so messy, and left my whole shower pink! The drying time was very fast, which made me happy. So overall, I gave this self tanner 2 out of 5 stars. This self tanner is an aerosol mist with a continuous spray. It comes out with a dark guide, and the guide is a red, pink color which I found odd. You absolutely must apply this one in your shower because it gets so messy. I started out by just spraying it onto my skin, but the product was getting all over my floor and left it a red color (keep in mind I have white Carrera marble floors!). So I then started spraying the product onto the tanning mitt they provided and then rubbing it onto my skin. I wasn’t pleased with either application process. Don’t get me wrong, the mitt is very nice and high end. But it soaks up way too much of the mist, so I felt like my skin was getting minimal amounts of product on it. And by just spraying the product directly onto my skin, it was so messy and even starting pooling up in some areas. After I finished applying it took a good 20-30 minutes to clean up my bathroom/shower. After the rough application process, Mystic Tan Sun-Kyssed Bronzer Spray took about 10 minutes to dry on my skin. I was happy that is didn’t take longer, and was actually surprised with how quickly it dried. My skin didn’t feel sticky either. Mystic Tan used to do a lot of spray tans (not sure if they still do). So if you’ve ever gotten a spray tan, that’s kind of what this product smells like. It has a perfumey smell, mixed with DHA. Wasn’t my favorite smell, but wasn’t the worst either. The “spray tan” smell stuck with me all night until I washed the product off the next morning. The perfume smell also stayed pretty strong throughout the night. Since the guide on this self tanning spray is pretty dark, I expected my tan to be pretty dark as well. After I showered it off, I was very disappointed with how light my tan was. It was nowhere near as dark as a spray tan. Now, I don’t know if that’s because I applied it using a mitt so I didn’t get as much product on my skin or not. But I had a light shade tan, with reddish undertones to it. This one does say it has “warm, red undertones”, so I’m not sure what kind of skin tone it would be best for. They have another spray option that is for “warm, brown undertones”, maybe that one looks more natural. I wasn’t impressed with the color at all, and I had high hopes for it. The good thing was my tan was even and streak free (although I don’t know if it would have been had I not used a tanning mitt). Mystic Tan Sun-Kyssed Bronzer Spray didn’t last too long on my skin. After 2-3 days my tan was sadly gone. No, I don’t think men will like this one. Mystic Tan Sun-Kyssed Bronzer Spray is $40 per bottle, and $6.67 per ounce. That’s a bit pricier than your average self tanner. To buy Mystic Tan Sun-Kyssed Bronzer Spray, Click Here. Look and Feel This is a continuous spray with a dark, red guide. Drying Time It dried very quickly, in under 10 minutes. Smell (Before) Smells ok, like a spray tan. Smell (After) Smells pretty strongly of DHA the next morning. Color Produced My tan was a light, reddish shade. How Long It Lasts It lasted only 2-3 days. Price It’s $6.67 per ounce which is slightly higher than average.